Right on the heels of releasing the first stills, Warner Brothers has released the (a?) poster for Legend of Tarzan. The poster features Alexander Skarsgard and an ape…..a very interesting choice — no Skarsgard abs, no Jane, more copper/brown imagery than green/jungle. There’s a lot of edge to this, in contrast to the romance of the stills. Hmmmmm… Need to chew on this a bit before venturing too much of an opinion. I definitely don’ t hate it. Not sure I love it. Here’s a larger version of the poster. Didn’t think of the ” progression of man” similarity but after you mentioned it,I see what you mean. Accept ,it’s going in the opposite direction with the ape leading out- more a digression of man. Maybe that was the intention. Yup. Right you are, Maggie. I’m not all-in yet on the poster …. the staging of it looks a little like those “progression of man” displays in museums …. but I think you’re right in your observations. I definitely don’t hate it, and I haven’t heard any “I hate it” commentary out there in the world yet. I’m sure it will come. But so far so good. Yes,I really like this poster as well. It not only gets the central theme of the story out there by using very powerful imagery but it makes it clear that this movie is not the Tarzan of Johnny Weismueller or the Tarzan of the Animated versions. In fact, this is not the Tarza of any previous movie or TV version.He is closer to the original ERB version ,in that he is primal and savage.The poster also, is adressed to the primary target audience( people who like edgy warrior films) due to the enraged faces- man and beast,together side by side. That positioning not only addresses the duality within Tarzan but also suggests that Tarzan’s ape tribe will take part in this film. No Cheeta like chimpanzees here. By releasing the still of Tarzan and Jane at virtually the same time we get the added idea that there will be a romantic side to this adventure , a softer side to Tarzan .Yet,due to Jane’s disheveled state and what appears to be dirt or bruises on her arms,it is implies that she will take an active part in the adventures.. The still of Tarzan alone makes it clear that Skarsgard ( whom some thought too skinny) has the appropriate physique for the part and that he won’t be the loin clad yodeling version that has become such an iconic part of the Tarzan mythology in films. Taken as a whole, these three images imply or suggest a lot things ,all of them good. They evoke facination,excitement,interest,curiosity and anticipation in a way that leaves a lasting impression on the brain . Whoever is going the the marketing seems like they know what they are doing- so far. I hope the trailer lives up to the promise of these three images. Production companies never read the books they convert to film. Tarzan: black hair and gray eyes. They got Jane right as a blond. I look forward to the film. I really like this. I think it fits nicely with the central theme of the story. 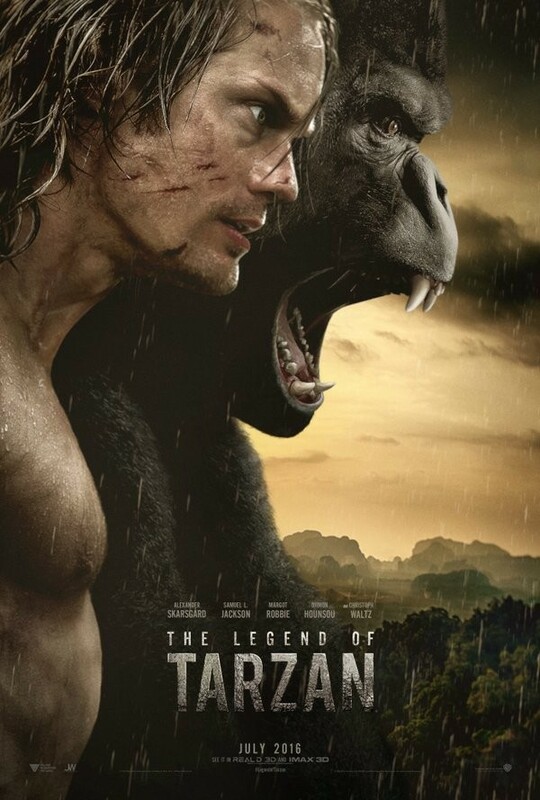 I think the juxtaposition in the poster between Tarzan and the Ape shows both the relationship between the man and beast, as well as intimating Tarzan “reverting back to a more animalistic state and lets that side of his personality out”. After all of the silence, I’m very happy with what they’ve done so far. Can’t wait to see what they do with the trailer. I’m still chewing on it. The stills resonated a little better for me …. but a) this gives it a little edge, b) it kind of balances the softer romantic imagery of the stills, and c) it suggests “superhero” ….. having him with the ape clearly implies special powers at least on the level of, say, Batman (oh no, someone’s gonna go off on me for that reference) ….. but the point is, “normal” humans don’t go to what appears to be war side by side with apes……. so it’s accomplishing a lot. I think showing man next to beast is powerful imagery. After the Tarnza and Jane picture that was to me a little story in itself, I’m at the time very impressed with this kind of marketing. Very clever.